DESIGN & BUILD THE COSMETIC DISPLAY YOU’LL BE PROUD OF! Product Name Cosmetics store furniture, cosmetic shop displays, display rack, display stand, interior design and decoration Suitable for retail shop, shopping mall, chain store, exhibition, showroom, beauty studio etc. 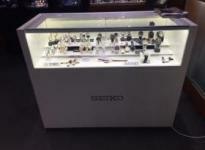 With well-selected high quality hardware accessories and exquisite workmanship, you will receive the durable and user-friendly display showcases. With secure and professional international packaging, you will receive the cargoes in very good condition at the lowest costs without any delay. EPE Cotton → Bubble Pack → Corner Protector → Kraft Paper Pack → Wood outer box. You can choose various trade terms, like EXW, FOB, CIF etc. and flexible transportation modes such as sea shipping, air transport, express door to door service etc. Ujoy Display is one of the leading design and manufacture specialists of custom retail shop, mall kiosk and store display furniture in China. Based in Shenzhen, we operate from 107,000 square foot of factory, office and showroom space, offering a modern manufacturing facility and professional project management. Our aim is to work out a professional one-stop solution that gives best satisfaction in cost, quality and delivery time. Ujoy team are not only highly-skilled and experienced, but also creative and reliable. We carry out complete design, manufacture, delivery and installation guide all over the world. 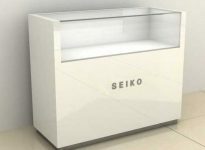 Our product range covers Jewelry Showcase, Watch display counter, Shopping mall kiosk, Cosmetics shop interior design, Clothing & Handbag store display stand, Eyeglasses shop display rack, Cellphone store display furniture, Museum display cabinet etc. We love to Design. We love to Build. We love to make it happen. Our designers pay great attention to your branding, budget and customer experience as they work with you to select materials, finishes and incorporate the latest technology into your fixtures and environment. 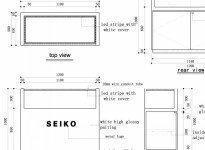 With floor plan, 3-D rendering and technical drawings, you get a visual solution for your shop or mall kiosk. You can choose various trade terms, like EXW, FOB, CIF etc. and flexible transportation modes such as sea shipping, air transport, express door to door service etc. With secure and professional international packaging, you will receive the cargoes in very good condition at the lowest costs without any delay. Quality is always the top priority. It is not only about well-chosen materials and advanced workmanship, but also the attention to details, and strictly management of project schedule. The display furniture is to showcase your products as well as boost your sales. Rush order is accepted to meet your tight schedule. After shipping, we will track and update the shipping status till you receive the cargoes. Most of the display showcases are assembled and ready-to-use. Our team is happy to offer installation and maintenance guide, to help you open and run the shop efficiently. “What we do today is working for tomorrow!” is our motto. One-stop Custom Solution for Retail Store and Mall Kiosk. Copyright © 2019 Ujoy Display Custom showcase, Mall Kiosk, Retail Store Design and Manufacture.